Say, you don't want to get lost in a tunnel, so you set a rope that leads back to the entrance (or likewise follow another rope set by another person). If you want to be mythological, the term is Ariadne's Thread. When Theseus entered the Labyrinth to kill the minotaur, he unwound a ball of thread given to him by Ariadne. Following the thread allowed him to escape the maze. Actually, guide rope (or guiderope) makes the most sense and it is easy to understand. 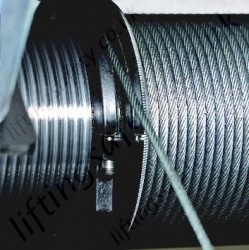 It is also used in various contexts for a rope that guides you back. He lost his light but was still able to pull himself out as he hadn't let go of his guide rope. Before entering the building, secure one end of the guide rope to a substantial object on the outside. The remaining rope is then carried by one member, designated as the "anchor". You should deploy a guide rope in any building where disorientation and depletion of air supply are possible. Large-area office building, hospitals and schools are excellent candidates for the guide rope, as are tunnels, ships and subways. Note: Guide rope has another meaning also but context is everything. Lifeline is another that could sensibly be used here, though it also has other meanings. This also has an echo in the thread that in some mythologies connect a body to the soul or spirit, allowing it to find its way back. Also, you can just refer to it as a "string" or "twine" or "spool" or if you want to be archaic, a "clew" (which has a nice homophone in "clue", which such a trail is!). What do you call a set of elements not including their ends? What should we call language that intentionally conveys the opposite of the literal meaning? What do you call a set of data that contains the position and dimensions of something? What do you call a set of objects that trigger a sequence of events? One word for the Point of No Return? What is it called when for comic effect, behavior and words typical of one situation are used in a different situation?